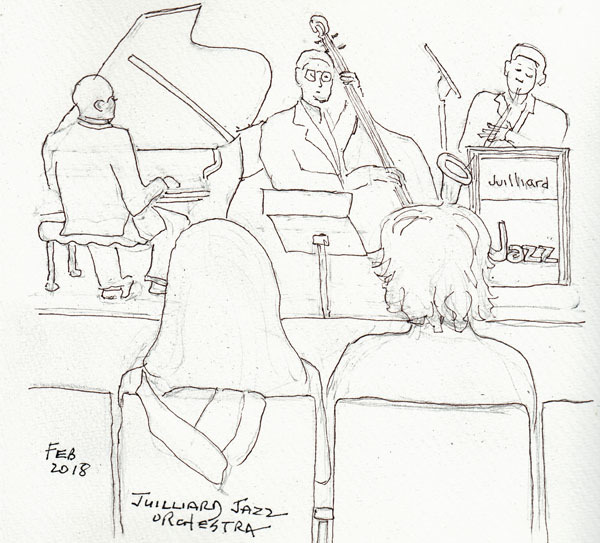 Juilliard Jazz Orchestra - A drawing done while we were listening to the Jazz Orchestra play at Juilliard - always a delightful experience. My days got away from me and I decided not to paint the page. Art on Paper - An annual weekend art show on Pier 36 in NYC. I always enjoy the variety of artworks displayed and like to find one piece that I want to draw in my sketchbook to remember the day. 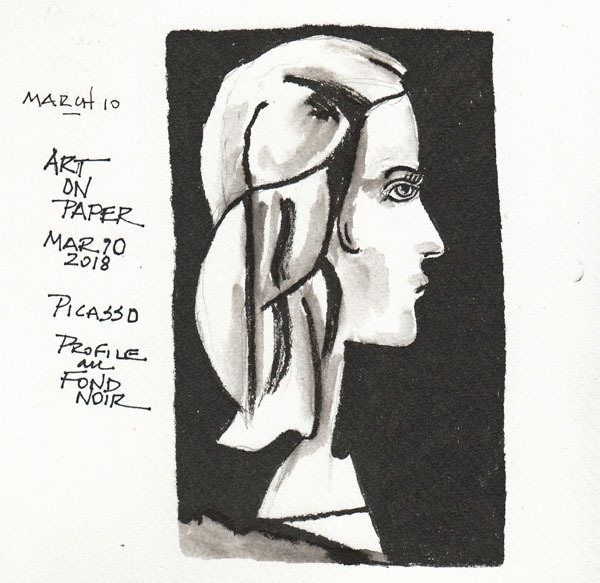 This Picasso print was in John Szoke's booth, and it gave me an opportunity to use my Pentel Pocket Brush Pen. Wine bottles at Tartinery - After the exhibit my husband and I walked through the Lower East Side to Little Italy for a mid-afternoon lunch. 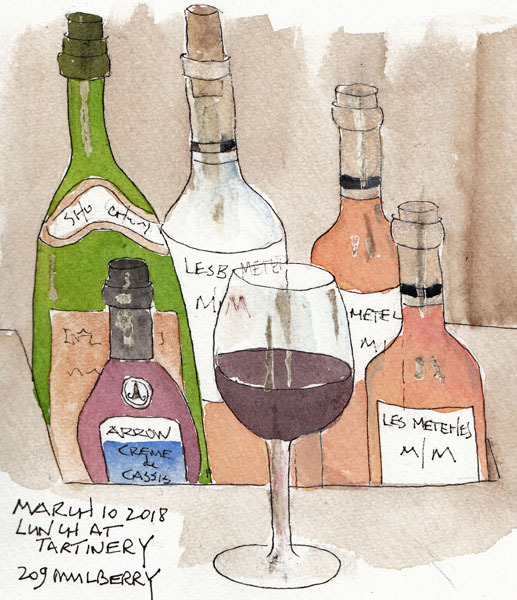 We sat at the bar to eat and I sketched the wine bottles in front of me. I just watched the second week of the first Strathmore 2018 online art program, and wanted to use masking fluid for the glass reflections. I used the squeeze bottle type of masking fluid, which I last used one year ago and the color had changed from light blue to green. After removing the mask, the green color remained on the paper! I need to go back to my Winsor-Newton masking fluid. I hibernate many days during January, partly because of the weather, and partly because I'm thinking about new projects. 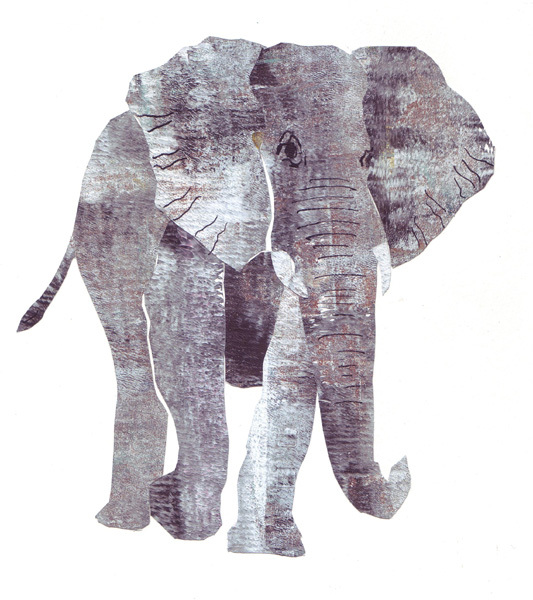 In January 2013 I did elephant drawings and paintings using every tool/medium I had in the apartment. I used videos of elephants for most of my drawings - pausing at images I liked. This remains one of my favorite elephants made that month. It is a collage created using the method of Eric Carle and previously made paste paper. Within the last several days my son linked to this elephant video and I can't stop smiling. I decided to republish my favorite elephant so I can share the video fun. Hope you enjoy it too. Last Friday I went to a Swann Gallery's "Drawings and Prints" Auction Preview with my friends Pat and Eunice. There was a wonderful selection of art, more prints than drawings, but everything was inspiring. After looking at everything I chose 2 drawings to add to my sketchbook. 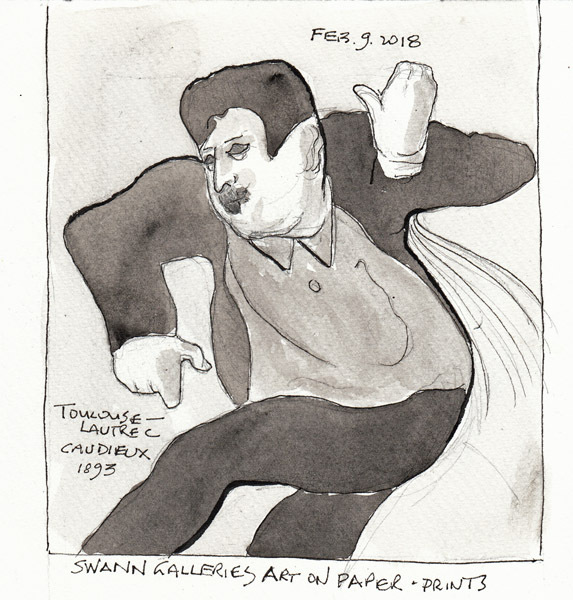 This was a drawing by Toulouse-Lautrec ("Caudieux - 1893") and I chose to paint it. instead of using charcoal. 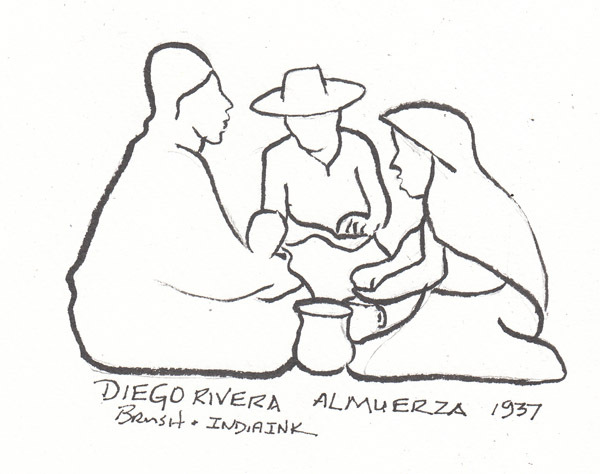 Almuerza 1937 - a brush and India ink drawing by Diego Rivera. After viewing all of the Art, which will be auctioned beginning today, we had a late lunch at Panera. 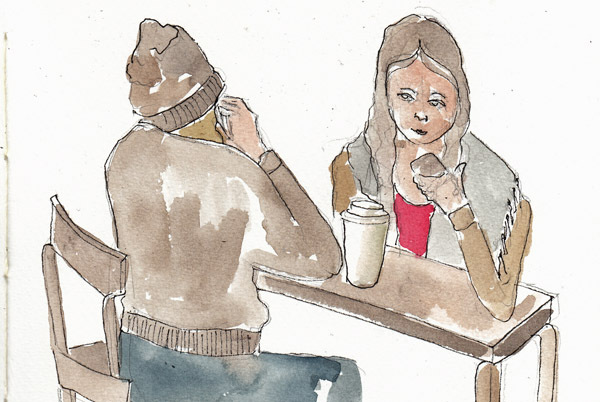 After lunch I sketched and painted several other customers. 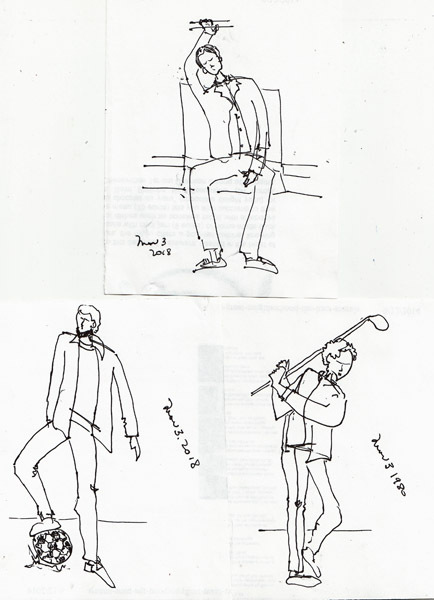 Suhita Shirodkar, who is one of the regular teachers at the USK Symposium, has a Craftsy Class about figure drawing using "Lines of Action" to quickly express movement. I periodically practice this technique, using photos from magazine ads and scrap paper. in her class she uses photo references to teach her technique, and then uses video clips to demonstrate drawing from moving figures. 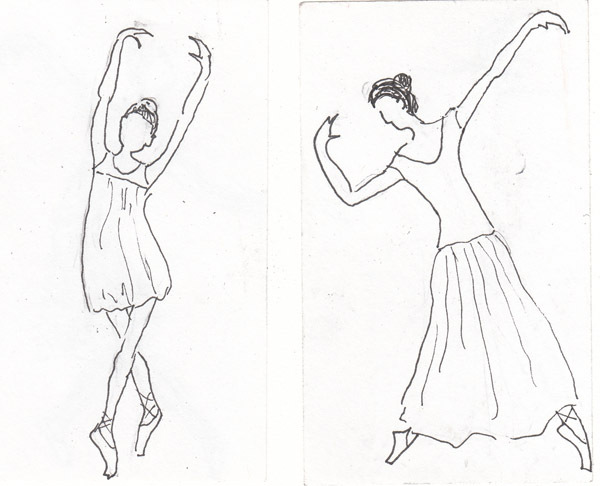 Here are 6 figures drawn from photos, and 2 figures drawn while I watched ballet dancers warm up. As soon as Spring arrives I need to go sit and watch figures doing something other than just walking! There are baseball fields, and basketball and tennis courts in Central Park - maybe that would be a good starting place. I am learning a great deal about creating comic books. This is way out of my comfort zone, but the class is set up so that we go slowly through the different stages of development. 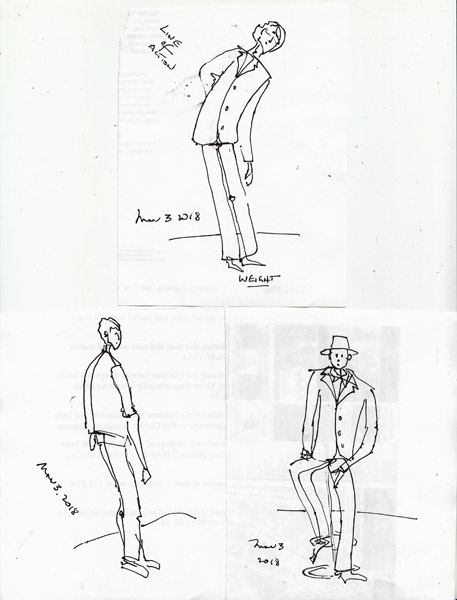 I created 4 characters and sketched "turnarounds" - front, back, and side views. The next steps were to build their world, develop the characteristics - good and bad - for each character, and now write a synopsis of the story for our next class. My characters live on the moon, but accidently travel to Earth. I used some NASA photos of the moon surface to figure out how to draw craters, and made up the rest. I was surprised to see Earth clearly above the horizon of the moon in their photos. 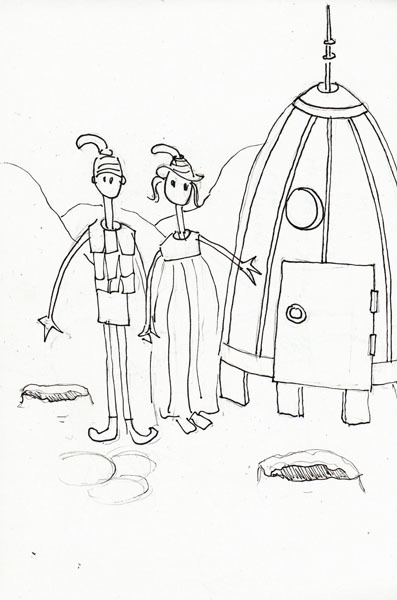 Axel and Alice mistakenly start his mother's small space ship, so this is them next to the Space Ship. These are just sketches and later will need to be made as panels, of varying sizes. A standard comic book is 22 pages. We only have to write a short story and prepare 3 pages - each of which may have as many as 6 panels. 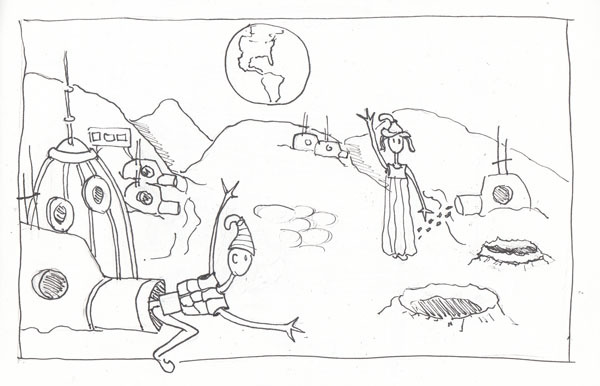 This is a link to my first blog post with Character "Turnarounds."